Prep. Time: 30 min. | Cooking Time: 90 min. Bread pudding is definitely born out of necessity. It was the creation of the family cook to keep things interesting and not have anything go to waste. Good bread quickly stales but it is perfect for a recipe like this one. I don't know anyone who doesn't have bread lying about. The beauty of this recipe is that the base is the bread pudding, but you can always be creative with add-ons and sauces. Raisins, dried cranberries and even dried apricots can be substituted for the berries in winter months whereas pineapple or mango would taste great in the summer. This is not an overly sweet bread pudding, so people can make it to their desired sweetness by adding as much honey as they would like. If you really want to change up this bread pudding recipe, omit the fruit, sugar, spices, and vanilla, add some veggies and cheese and make a savory bread pudding...perfect for brunch. Preheat oven to 350 F. Grease a large square baking dish. Place a clean kitchen towel in a roasting pan and place the baking dish on top. In a small saucepan combine scalded milk and butter. Stir until butter is melted. Let the butter cool to lukewarm. In a large mixing bowl, combine sugar, eggs, vanilla extract, cardamom, nutmeg, and salt. Beat with an electric mixer on medium speed for about 2-3 minutes or until foamy. Slowly add ¼ cup of milk mixture at a time, to make sure you do not curdle the eggs. Place half of the bread in the bottom of the baking dish and press the bread down. Add all the berries on top and layer the rest of the bread on top. Then pour the custard on top, making sure to disseminate the spices that may have fallen to the bottom of the mixing bowl. Gently pour hot water into the roasting pan with the towel, making sure to wet all of the towels. This creates a water bath – which will make the pudding cook evenly by steaming it. Cover the entire roasting pan/ baking dish with foil. Gently place in the preheated oven and bake for 50 minutes. After 50 minutes, remove the foil and bake for another 15 minutes to brown the bread. Rotate the dish about halfway through for even browning. Remove from oven and let stand about 15 minutes before serving warm. 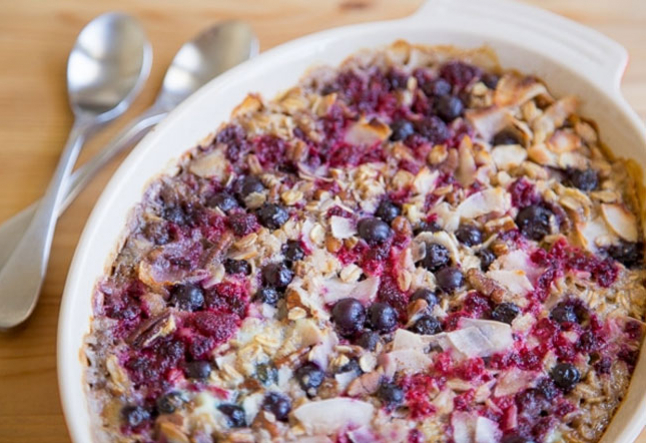 To serve, drizzle with as much honey as desired and top with fresh berries. Use gluten-free bread to make this recipe gluten-free. 6 cups soft bread, torn into small pieces - try challah.